For a town of its size, it's surprising there aren't more bands from Reading. It has its fair share of literary and screen giants - Oscar Wilde, Jane Austen, Ricky Gervais, Kate Winslet - but musically it's never quite made it to the premier league. Just as well then that bands like local metallers Exit Ten continue to punch above their weight. Which isn't to suggest they are not worthy of the acclaim that comes their way. 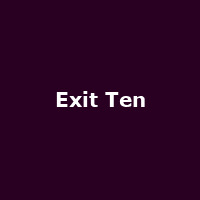 On the contrary, in the seven years or so since the three Steele brothers teamed up with Joe Ward and Ryan Redman, Exit Ten have gone from strength to strength. As early as 2004 they were playing the NME stage at the V Festival and in 2008, the year they released their debut LP 'Remember the Day', Exit Ten played the Download Festival. 'Remember the Day' didn't break the UK top 100 albums chart (largely due to the label, Pinnacle, going into administration) but it was nonetheless well received with Metal Hammer rating the record 9/10 and Kerrang! giving it four stars (out of five). The follow up, 'Give Me Infinity' is set for release on 10th October 2011, a week before the Berkshire boys take the new material on the road. The new album was recorded at Outhouse Studios in Reading with producer Jon Mitchell (Enter Shikari, You Meet At Six, Funeral For A Friend) and promises much. Exit Ten's autumn dates kick off in High Wycombe on 17th October, followed by gigs in Southampton, Exeter, Guildford, Nottingham, Birmingham, Manchester, Glasgow and loads more, before the final show of the run at the Camden BarFly on Monday 5th December 2011. We have tickets for all dates available now, priced from as little as £6 and all are under a tenner (even London). Support for the tour comes from Fei Comodo and Never Means Maybe.